Death counts on Dhaka's roads have reached unbelievable levels lately. The recent death of Shammee Akhter, a university student who was hit by a speeding minibus violating a traffic signal and many others before that, only testifies just how dangerous the city's roads have become. Invariably, it is a hit and run case or one in which the driver is never found. With more and more reckless drivers, unfit vehicles plying the streets and a burgeoning population within the city's perimeter, it is not surprising that gruesome accidents have become an everyday affair. But there are many more reasons for such avoidable tragedy. Lack of walking space, inadequate road space and the absence of enforcement of traffic rules and even irrational pedestrian behaviour can be attributed to road accidents. 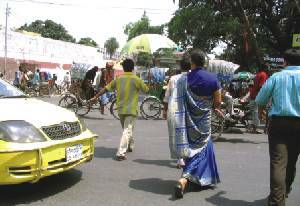 But most of all the complete apathy of authorities to enforce laws and bring about a semblance of order to the city's mad traffic, has led to higher numbers of unnatural deaths on Dhaka's brutal streets.